One day after Arizona Cardinals head coach Bruce Arians announced he was retiring, the team’s quarterback followed suit. In an open letter the Cardinals published on their Twitter account Tuesday afternoon, Palmer announced that he’s retiring from the NFL after 15 years in the league. Unfortunately for Palmer, the end of his career was far from perfect. His last NFL game was a 33-0 loss to the Rams in Week 7 of this season in London. Palmer left that game with an injury and was later diagnosed with a broken left arm that kept him on the sidelines for the rest of the season. But after spending 15 years in the NFL, Palmer is fine with not taking another snap. Palmer, of course, was the 1st overall pick in the 2003 draft. However, the Cincinnati Bengals chose to sit him during his rookie season. He was then able to hit the ground running when he made his NFL debut with the Cincinnati Bengals in 2004. Palmer was a three-time Pro-Bowler, going in 2005 and 2006 with the Bengals and then again in 2015 after a renaissance with the Cardinals. Palmer finished his career with over 46,000 yards passing and 294 passing touchdowns. In terms of team success, Palmer fell a little short of expectations for a 1st overall pick. He played in just four playoff games and never reached a Super Bowl. Of course, if not for a pair of untimely ACL injuries during the 2006 playoffs and 2014 regular season, things could have been different for Palmer. The retirement of Palmer and Arians, as well as the expected retirement of wide receiver Larry Fitzgerald, leaves the Cardinals at a crossroads heading into the offseason. The Cardinals now have no quarterbacks under contract with Drew Stanton, Blaine Gabbert, and Matt Barkley all set to be free agents. Arizona could look to sign a quarterback in free agency or explore their options in the draft. 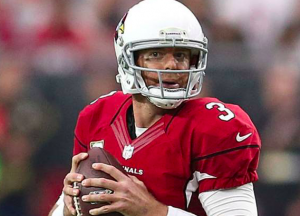 No matter who becomes Arizona’s next quarterback, it’ll be tough for the Cardinals to find someone to play the position as consistently as Palmer did for more than a decade. However, Palmer says he’s not necessarily going to remember the nearly 4,000 passes he completed, the 340 sacks he took, or even his eight career rushing touchdowns. He says something else stands out about his 15 years in the NFL.